This is the 4th of a 5 part series about some of the little things you can start or stop doing that can make a big difference on how you are perceived as a leader. When I first started training new managers, we used a DDI program called “Interaction Management”. One of the program’s three “Key Principles” of leadership was “Ask for help in solving the problem”. At the time, it seemed overly simplistic and somewhat contrived, but being a new trainer with no real management experience, I stuck to the script and enthusiastically promoted the concept. We even had managers role play asking for help, as if they were learning some new language. Little did I know how important that simple concept could be for a leader, and not just for new ones, but experienced senior leaders as well. 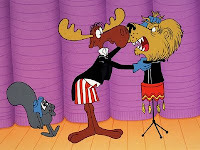 Just like Bullwinkle, it was the right trick, but it’s often poorly executed. I can’t tell you how many times I’ve had meetings with senior leaders and at the end of the hour, not once did they ask me for my opinion. I once even timed a new VP. It took 57 minutes (in a one hour meeting) until he finally said “So what do you think?”, as he glanced at his watch. At least he remembered to ask. I recently came across the concept again while reviewing Tom Peter’s new book “The Little Big Things: 163 Ways to Pursue EXCELLENCE”. I really like the way Tom has made it easy for leaders to apply this concept. Just memorize 4 words and use as often as possible. Asking for the opinion of others – especially your direct reports – is a show of respect and a powerful motivator. Just remember that when you do, you have to actually mean it. Ask early, not after you’ve already made up your mind. Listen for possibilities, not for points of disagreement. Always express your appreciation. If it’s a misguided idea, then use it as a coaching opportunity. If it’s a keeper, than make sure the person gets credit for the idea. OK, so maybe it’s not so simple. For now, just say the words. Try it at home too. The, sit back and listen. Listen for the non-verbal feedback as well - the energy level, the body language, the tone, and expressions. You’ll see what a big impact you’ve had as a leader. Getting opinions and suggestions from those that are actually assigned to accomplish a task is a wonderful way to create an effective organization. Getting people involved (at any level) is crucial to building an effective team. Some of the most effective ideas come from the people closest to the frontlines. "What do you think" is an excellent way to get team members within your organization thinking about what they can/would do to make the operation better. I'm looking forward to part 5 of this series! Welcome back from vacation. Hope it was great. What do you think? Simple, but brilliant question. I've been spending a lot of time lately getting clients to ask each other questions that start with the word, "What" and making them promise not to inject their own opinions or answers into the conversation. It's amazing how much everyone learns when they quit offering each other answers and just stick to the questions. What do I think? I think I'm going to order Tom Peters new book right now. Thanks Dan. I believe asking others around you what they think is important for getting individuals to feel a part of the process. To often workers can start to feel as if they are just being told what to do and never get any voice in decisions. This really does help in giving everyone ownership and can lead to improved morale as well. I always love your posts. I agree with you on getting the input from others. As an engineer, I know the input from those who will actually do the construction for my projects is essential. If I don’t get the input from them on complicated projects, even when I know what to do, it can sometimes cause problems. Those problems come mostly from them not buying in on the projects. If they don’t buy into the projects, they begin to be frustrated with me even if it is what they would have done in the first place. Getting others opinions is very important for everything to run smoothly. There is also so much to be learned from others and their experience. Another great post! I cannot agree more often times that our leaders would not seek the opinions of their subordinates. Many times they have already made up their mind before asking what do you think out of courtesy. I believe it is important for them to mean it when they ask the said question. Otherwise, they are no better for not asking it. Again, thanks for another great post. Thanks for the great advice! I think it is so important to make sure employees are engaged in the decision making process at work. Not only does it show employees that their opinions are valued, it provides multiple viewpoints to problems/solutions, and it gives employees that necessary “buy in” or ownership of the company’s direction. Asking someone what they think opens up the door for creativity and collaboration, which is essential for company growth. Thanks, you've pointed out some additional benefits. Vacation was awesome, thanks for asking. Sounds like more great coaching for your clients. Thanks for a very real example that really brings the concept to life. Thanks. right, being sincere is key. Thanks, great summary of the benefits. Very good point. I think by leaders asking for the opinions of their subordinates at the very least it shows a high level of respect. Maybe the employee will have a great idea which the manager didn't think of, maybe he or she will agree completely with the manager's idea, or maybe the employee's idea really just won't work in this situation. You don't know until you ask though. Obviously there are certain instances where the manager can't really ask for employee opinions, such as the details of staff reductions, but when it comes to projects I think it's great to get multiple ideas to the table. Thanks for writing this series. I've found it very interesting. I hope you had a great time in Italy. As always good points and reminders we can all use. It's easy to to realize that this needs to be done however, sometimes we can be caught up in our own ideas and solutions that we may fail to consider our employee's thoughts. Just making a point to say those "four most important words" and I think we can get a lot ideas and perspectives we might not have seen from the front line. Not only does it help your employees, but it embraces the "wisdom of crowds" effect--the more people you ask, the more combined answers you'll get . . . and the close you'll be to the solution! I think those four words are important words for life in general, it is so true when you ask someone what they think you are showing them you trust and value you what they think and how they feel. When my boss asks what I think and really means it, it makes me feel extremely important and like I bring value and worth to the company. Great advice for any leader, remember those four words! Despite Mr. Peter's bestselling book, I would suggest that "What do you think?" are four of the most dangerous words a Boss can utter. The primary problem is employees will typically respond with their thoughts and ideas. Then what do you do? I mean you got to your position as a Boss by adherence to certain procedures and policies. New ideas can upset the established order and jeopardize your position as Boss. I say NEVER ask an employee his/her opinion. Dan, We can't bang the drum of engagement enough. I believe that part of being human is the want and desire to contribute and make a difference. This holds true at work. To me it's more than showing respect or a motivator - it's a genuine way in which we interact with each other as people. So glad you're sharing with your readers this important reminder. I'm now a regular reader. Thanks for your thoughts. And I did! Thanks. Easy to do, with BIG benefits for all! OK - you've GOT to be kidding, right?! Great post. Thank you for the reality check! Can a Woman Leader Be Successful and Happy?